For long-time martial art enthusiasts, Kathy Long is a household name. A five-time women’s kickboxing champion and black belt in three different disciplines, Long’s list of accomplishments in the fighting world is an illustrious one. She is the first woman to be featured on the cover of Black Belt Magazine, served as a color commentator at UFC 1, and has appeared on screen in a number of recognized films and television programs. Today, Long is currently training for a return to the mixed martial arts cage. She will be turning 51 this week. Long trains at the HQ Brand Training Center in downtown Los Angeles, one of a few places where the former champ also teaches kickboxing classes during the evening. During the day she attends a striking session with renowned MMA legend Josh Barnett, who acts as her coach and part-time manager in finding her a return fight. In the fight game, the business equation is a logical one: the longer a fighter is around, the more potential promoters have in cashing-out on a championship name. Investing in a fighter is essentially an investment on youth, and with Long on the horizon of her 51st birthday, it is unclear how many fights her return entails, or if she still retains the athletic capacity to compete at an elite level. It’s been almost six years since her last competitive outing and that contest was her first inside the MMA cage. However, these considerations don’t seem to concern Long. Long is inside the cage with about ten other students going through striking drills. Her sparring partner is a male fighter that looks about half her age and outweighs her by a good twenty pounds. Barnett yells out a sequence of kicks and punches, and though the pattern is predetermined, the shots still come in at full force, flipping her hair around as she blocks the impact. Long takes a hard kick to the shin and limps to the corner, grimacing in pain as she stretches her calf against the fence. “Occupational hazard,” she says to me with a grin. When she returns to take her turn to strike, the intensity is returned in favor. The way her legs give a slight twitch before she shoots show that she’s been doing this for decades. Though Long is mostly recognized for her extensive career in competitive kickboxing, her introduction to fighting started in the traditional martial arts. She holds black belts in Aikido and Shorinyu Karate, and also has a master rank in Kung Fu San Soo, a practice that employs quick applicative attacks, such as eye gouges and sharp thrusts to the windpipe. While the triple-black belt has long ago mastered lethal techniques in multiple disciplines, her initial draw to marital arts was born of the contrary. Long describes the environment at home as a “dictatorship”, appointing her father as the tyrant and her continued involvement in martial arts as the means for escape. Over time, Long went on to gain considerable recognition in the traditional martial arts community until an observer challenged her to a kickboxing match during a karate tournament. After a ten-day crash course inside a boxing gym, Long took the match at a 70-pound handicap, and by her description, the two “beat the crap out of each other.” Though there was no official victor declared in the exhibition, the experience kept Long in the sport, and she went on to compile a final record of 18-1, (though according to Long, the real number is around 35-1-1) while picking up five separate world titles along the way. 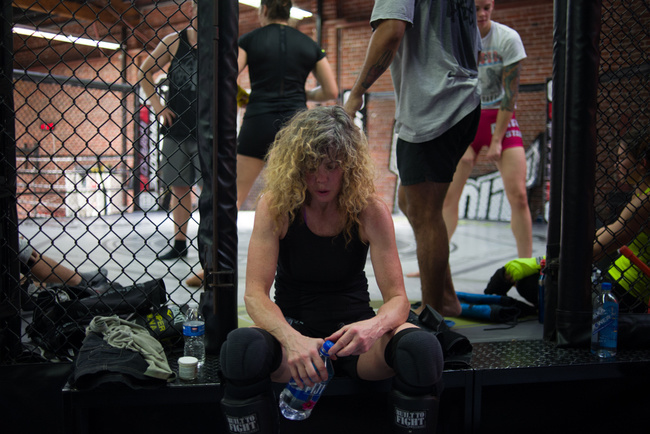 In a time where competitive women fighters were an anomaly and largely unsupported, one becomes curious to what kept her going in the sport for so long. “Hell Days”, described by Long, included sprinting up, down and across football bleachers for five three-minute rounds. After the five rounds, the ritual was repeated with a sparring partner thrown over her back. Then the routine was taken onto the field where the fighters ran four 40-yard sprints with a minute rest in between, each successive sprint required to be within ten seconds of the first. Wind sprints starting at the 5-yard line and ending at the 100-yard line followed. A full-field duck-walk capped off the workout. Long’s professional kick-boxing career began winding down in the early 90s and she would go on to make a string of appearances on film and television, most notably as Michele Pfeiffer’s stunt double in “Batman Returns”, and alongside Church Norris in “Walker, Texas Ranger.” In 1998, Long made a brief year-long return to the professional boxing ring, compiling a 2-1 record with a sole loss against Lena Akeeson, who was 7-0 at the time of their meeting. Fast forward eleven years, and Long would take her first, last and only MMA match against Avery Vilche, winning a 3-round unanimous decision. Though she had intention of continuing after her debut in the cage, a torn ACL has since kept her on the sidelines. Now approaching her 51st birthday, Long is fully-healed and ready for another run. One factor to consider in her return is that the landscape of women’s fighting has changed considerably since Long’s reign. Before, an elite female fighter was seen as an oddity in an industry dominated by men, but now she is entering an era that has significantly shifted its gender politics, chauffeuring in a large talent pool along with it. And with the top fighters of the sport still in their prime, the path to a championship appears as a near impossibility for 51-year-old fighter. But for Long, the change is a welcomed one, focusing more on the bigger picture than any challenges it might present toward personal aspirations. Competing in combat at an advanced age has been done before. Kim Woods fought her third MMA bout at 49 and perhaps the best example of age defying youth is boxing’s Bernard Hopkins. But Woods never cleared the level of small local cards and Hopkins never had a six-year exodus from fighting. While it is still to be determined whether or not Long goes after a title shot, she certainly isn’t planning to return just for the sake of it either. The point is, the cliff that Long intends to climb is a steep one. But when looking at the life and career of Kathy Long, obstacles are merely challenges to be overcome and she has survived much more outside of the sport than inside. If there’s anything to be learned from her story, it’s that doubts are only given the power equal to the belief placed behind them. That is, at least, what Long believes her return communicates. Before BJJ, there was Bartitsu. The ties that bind are strong. A surf icon helps MMA keep its sense of tradition. When Flesh and Sweat Meet Future-Music: Holly Herndon, "Movement"
Is Japan Tiring of Whale Meat? LAYERS: Peeking Inside Eluvium's "Envenom Mettle"
© 2019 Vice Media Inc.